The Cafe Oto wasn’t exactly thronged for the return of Huntsville to Dalston last night, but the audience was highly attentive and rewarded the Norwegian trio with warm and sustained applause at the end of their unbroken 75-minute set. Those of us who had missed their previous visit to London in their present incarnation, when they played the nearby Vortex in 2009, and knew their music only from records, couldn’t help but be impressed by the sense of interplay developed by these three improvisers over the course of their years together, and by their command of the music’s overall shape and its intimate textures. Ivar Grydeland plays guitar and laptop, Tonny Kluften plays bass guitar and Ingar Zach plays percussion — including, as the publicity puts it, “sruti box, tabla machine and drone commander”, as well as several of the basic elements of a conventional drum kit. Stig Ringen, their sound engineer, acts as a fourth member of the group. If the process of Huntsville’s music is a little bit like that of the Necks, in that both groups tend to use the slow modification of regular pulses and repeated figurations as the basis of extended collective improvisations, the sound they make is very different. Grydeland’s Jazzmaster is not just plucked and strummed but struck with a small mallet, modified with various devices and otherwise manipulated to produce a dramatic variety of metallic clanging and whining sounds (when he lets single notes hang in the air or bends an arpeggio out of shape, the effect is like that a Japanese koto). Kluften makes considerable use foot pedals to adjust the tone and volume of his nimble lines. Zach spends a lot of time occupying himself with arcane devices — one of them attached to an iPad — whose effects are often difficult to disentangle from the overall mass of the sound to which he is contributing, but there were two lengthy passages last night in which he used wire brushes on his snare drum to produce an up-tempo shuffle rhythm of phenomenal momentum. Their first two albums, For the Middle Class (2006) and Echo, Arches & Eras (2008, featuring the singer Sidsel Endresen on one tune and Wilco’s Nels Cline and Glenn Kotche on a long improvisation recorded at the Kongsberg Jazz Festival), were released by Rune Grammofon. A couple of years ago they moved to the Hubro label, which shares an office in Oslo with Rune Grammofon, and for whom they made their debut with For Flowers, Cars and Merry Wars (2011), which also featured the voice of Hanne Hukkelberg. Their fourth album, released a couple of weeks ago, is just the three of them. Called Past Increasing Future Receding, it was recorded in Oslo in a dimly lit barrel-vaulted studio (formerly an artist’s mausoleum) with a 20-second reverberation. 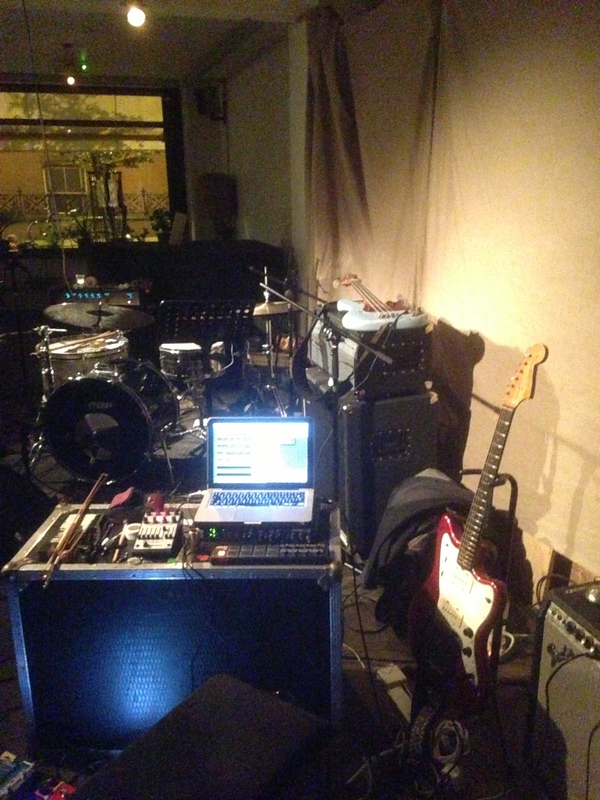 There are three tracks: the opener, “Presence in Absence”, contains one or two violent shocks for the unwary listener who might be lulled by its apparent quietness into turning up the volume control; “The Flow of Sand” explores their fondness for playing over tamboura-like drones; and “In an Hourglass” is glowingly contemplative, featuring that koto effect from Grydeland. Here’s a two-minute clip that gives some idea of the making of the album and a tiny glimpse into what they’re about (there are more extended examples to be found on their website: http://www.huntsville.no). I left Cafe Oto feeling my time had been well spent; it’s always a pleasure to be with musicians whose imagination, spirit of inquiry and disdain for generic boundaries ensure that the future will be as exciting as the past.